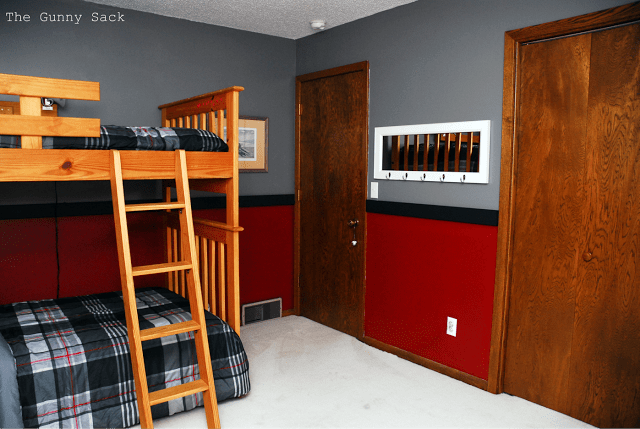 This red and gray Kid’s Bedroom Makeover looks so fabulous! 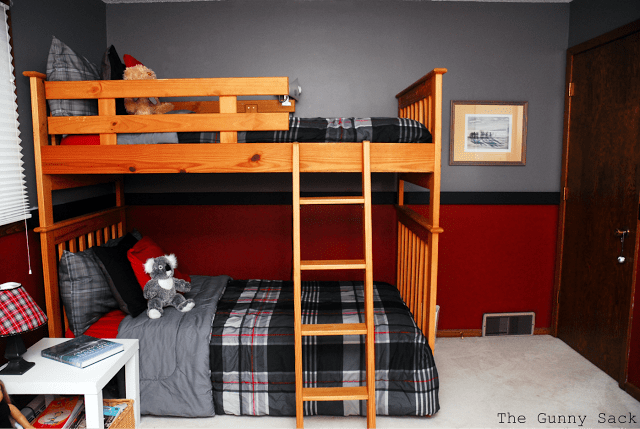 It’s amazing what a difference paint, new bedding and some little touches make to a room! 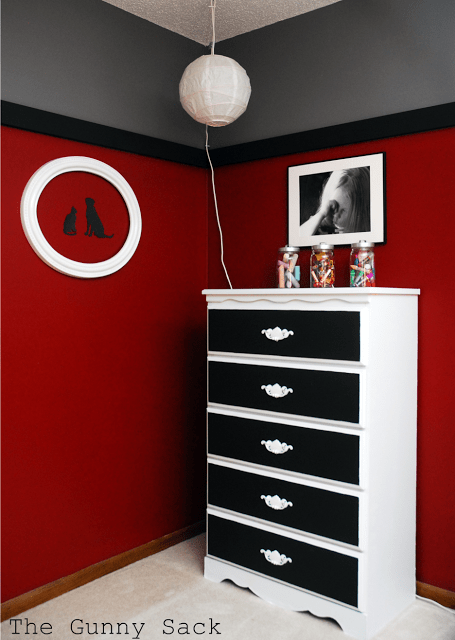 The colors I used were Red Delicious #WGR22 and Seal Gray #WGN65 from the Glidden Brilliance 2in1 Collection at Walmart. 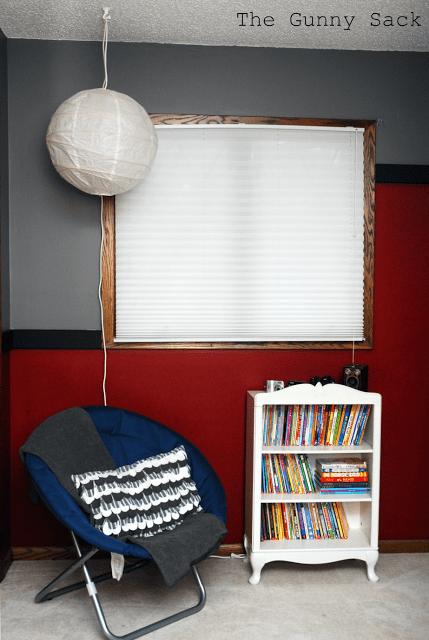 A little reading nook…no, I did not get around to recovering the chair but I did add an Anthro DIY Ruffled Pillow! 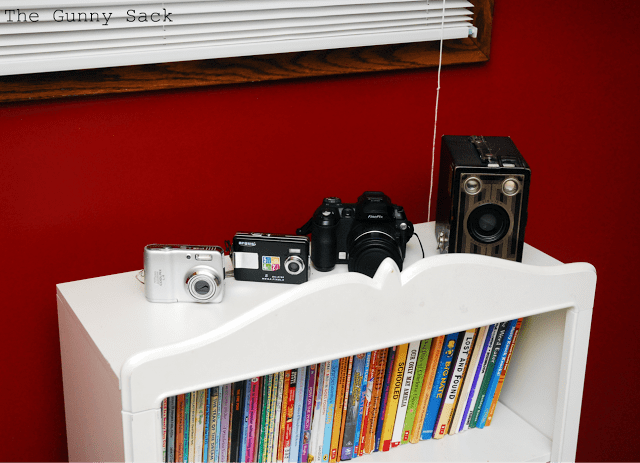 Vanessa (my daughter) loves photography, so I put some cameras on her bookshelf: one vintage, one she shares with her brother, one she got for Christmas and her first digital camera. 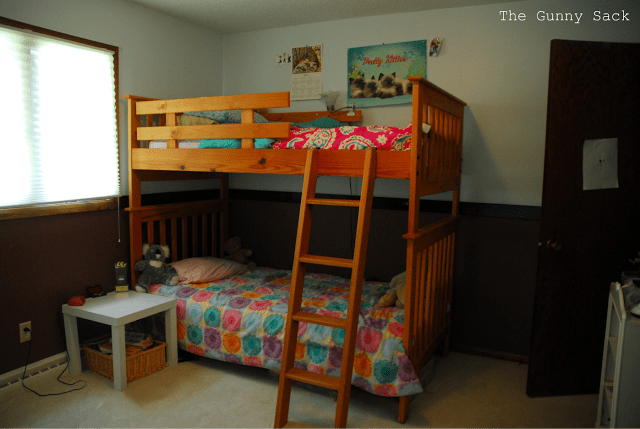 Check out her framed photo, at the foot of the bunk bed below, that won 1st prize last year at school!! 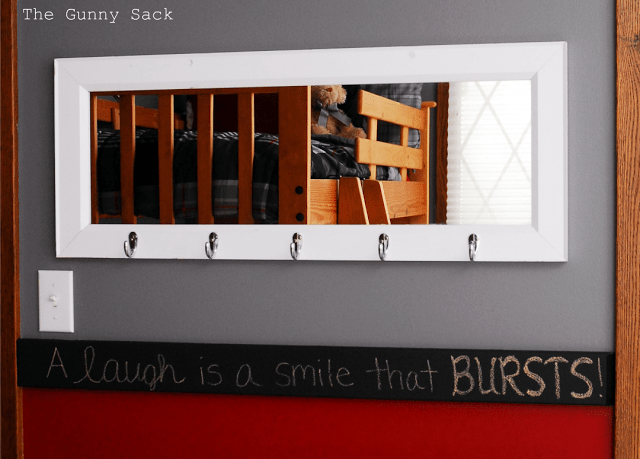 At the foot of the bunk bed, you can see Vanessa’s winning photo! The comforter and body pillows were purchased at Walmart. I recovered the lamp on the nightstand. Okay, now for some fun surprises!! 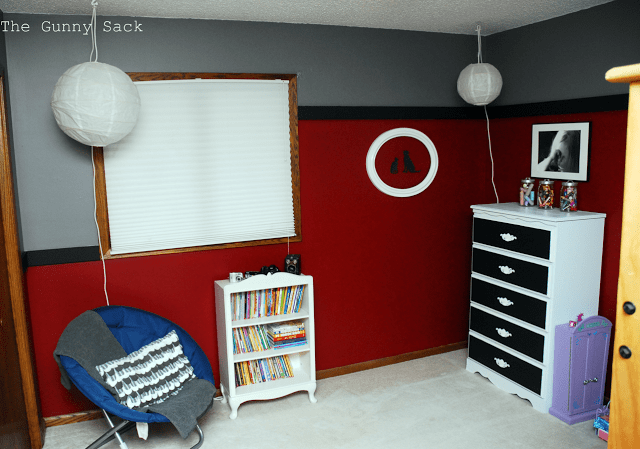 I painted the black trim in the room with chalkboard paint as a fun way for Vanessa to be creative in her room! 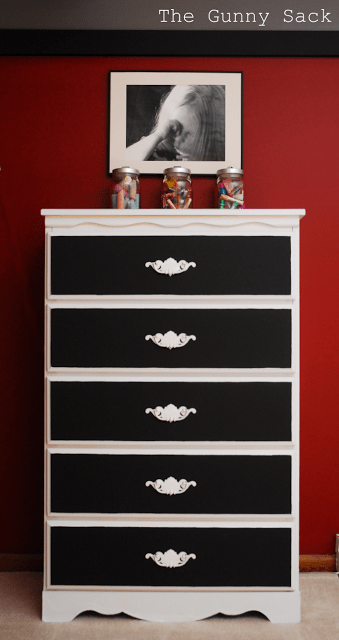 I painted this dresser and the handles. 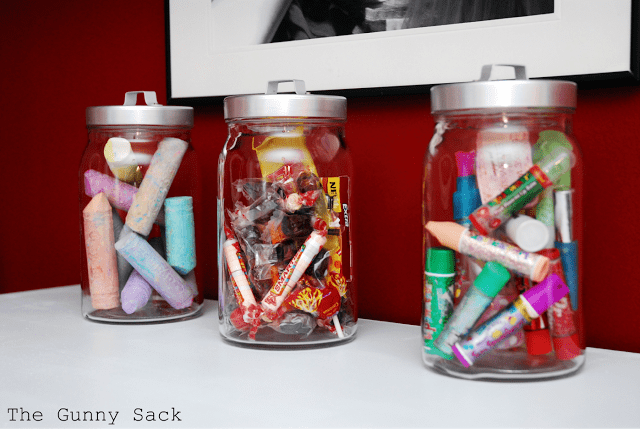 What’s in the jars? Lip Gloss, Candy and Chalk! 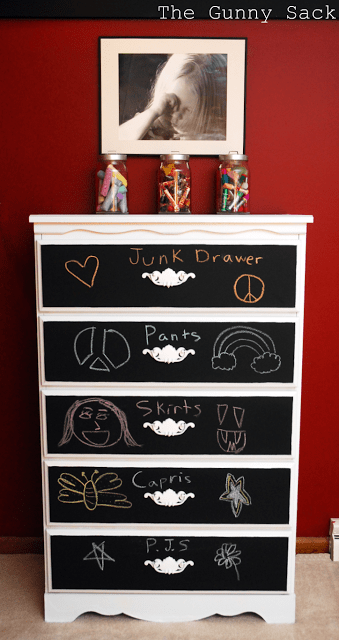 And the chalk can be used on the dresser too!! Now, here are a few before pictures for those of you that didn’t see them…. Mismatched bedspreads with brown and light blue paint from the previous owners. 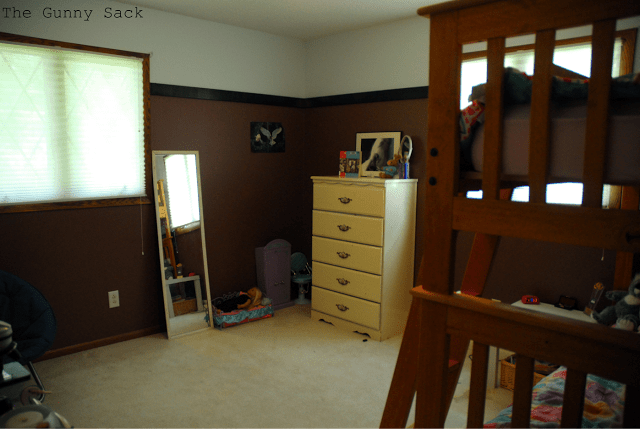 I want to say a huge thank you to Glidden Brilliance Collection 2in1 Paint from Walmart for giving me this opportunity to paint my daughter’s room! 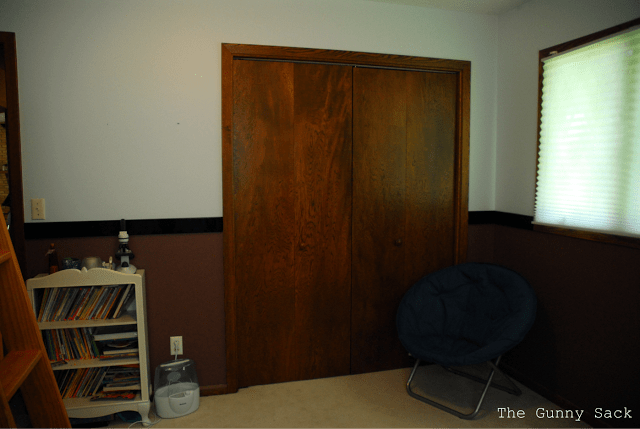 The new paint inspired an entire room makeover and we couldn’t be happier with the results! This paint was fantastic to work with!! Many people have trouble painting reds but I had no trouble at all. I am sure the fact that I was painting red over brown helped but I think the primer that is already in this paint really helped! I only had to do one coat with some minor touch-ups! I love how you moved the cherry rail up higher. It looks great, isn’t it amazing what a little paint can do. Oh wow, fantastic job! 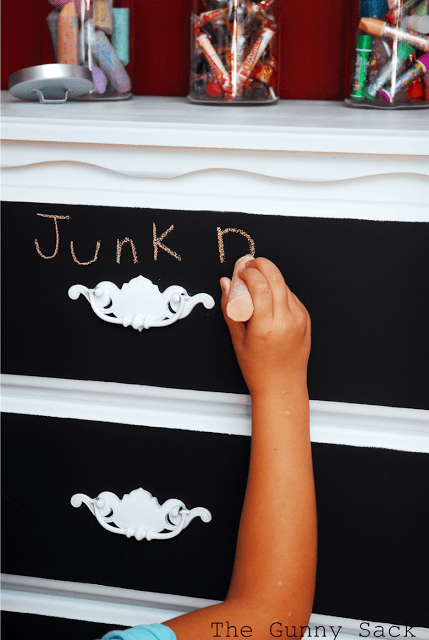 I love the chalk board dresser! What a fun idea! you did a great job adding detail where it would matter most. What a fun room! 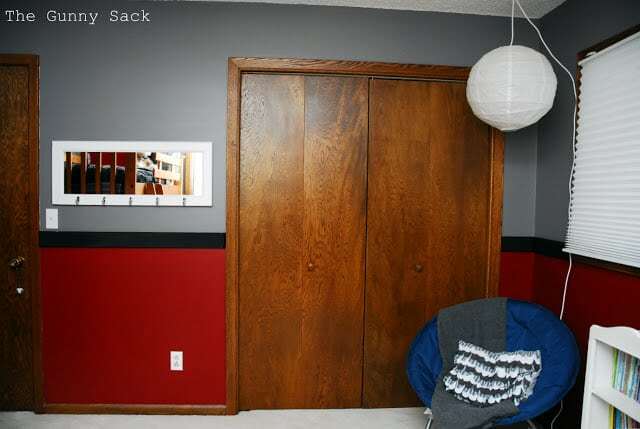 that dresser is fantastic. i am pinning it! 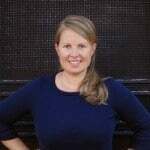 if you want to see it, go to my blog and click the pinterest link in the sidebar. i’m pinning it to my home sweet home board! WOW!!!!!!! I LOVE IT! That is an amazingg tranformation – your lucky daughter!!! I bet she just LOVES it!